New home on third floor encourages collaboration, unites faculty in one building. 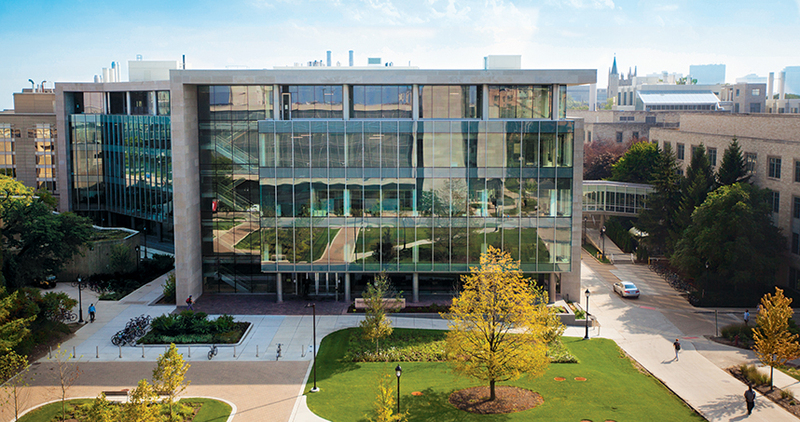 Computer Science at Northwestern Engineering is now in one unified space as the faculty moved into the Seeley G. Mudd Building in September 2018. With inviting public areas, the 22,600-square-foot facility on the third floor of the newly enlarged building is designed to encourage intentional and spontaneous collaboration between faculty and students at the McCormick School of Engineering. Interest in computer science among students at Northwestern has grown significantly, with the number of computer science majors more than quintupling from 65 to 345 along with non-majors taking many advanced classes. A 1,638-square-foot common area for faculty, students, and visitors to relax and meet. Four breakout rooms and two open areas can be configured to meet a variety of groups’ needs. A 1,143-square-foot area with seating for 48 people that can be configured for faculty meetings, lectures, and industry talks. A 597-square-foot, six-sided gathering space which can be configured for a variety of meetings. The studio includes a sideboard, sink, and refrigerator for breakfast or lunch meetings. Five workspaces, each about 250 square feet, that can be made public or private by opening or closing garage-style glass doors. A 287-square-foot conference room that seats eight and features privacy glass that can go from transparent to opaque at the flick of a switch. Previously, CS faculty offices were divided between the Technological Institute and Ford Motor Company Engineering Design Center. Watch the video: The Power of Computer Science.